This is one of the first posts on my blog. It was orginally written for my family and meant to be printed out. I decided to instead write it in blog format. I have changed the layout of the article and have written individual blog post for most of these Rowells. I was then going to delete this post but decided to keep it until I have a post about all the members of my Rowell family. John, fourth son and fifth child of Philip and Sarah (Morrill) Rowell, my sixth great grand father, was born in 1683 in Amesbury, and baptized April 30, 1699, in Salisbury, MA. In 1729 he went to Chester, New Hampshire, and settled, June 14, on the north part of lot No. 114. On July 1 of that year he bought lot No. 50, and with Beniah Colby divided the two lots crosswise. He died February 1, 1736, in Kingston. New Hampshire. He married, March 2, 1715, Elizabeth, daughter of Samuel and Dorothy Colby. She was born December 7, 1694, in Amesbury, and was living in Chester in 1741. Three of their children were, born in Amesbury and the others in Chester, namely: Enoch, Judith, Benoni, John and Eliphalet. Note about Chester and Candia: Chester was incorporated in 1722. It is in Rockingham County. Candia was once part of Chester, it seperated and was incorporated in 1763. Note about Kingston: Originally part of Hampton, New Hampshire. It was the fifth town established in New Hampshire. Enoch Rowell, Senior, was my fifth great grandfather. He was born in Amesbury, Essex, Massachusetts in 1725. He married Miriam Converse in 1746, and died on his way home from fighting in the Revolution at Ft. Ticonderoga, New York. He was 51 years when he died. There is little information available about Miriam Converse, her parents are unknown. Enoch moved with his father to Chester, New Hampshire. He assumed control of some of his father’s lands after his death. Enoch was one of the first settlers in Candia, New Hampshire. In 1764, Enoch was elected to serve as town constable. No.l. Enoch Rowell was the first settler on the lot on the south corner of the road where the Masonic Hall is located. He was a soldier of the Revolution and died at Ticonderoga in 1776. Various parties owned the place and About the year 1820 John Sargeant, who was a son of Jacob Sargeant, jr., and a grandson of John Sargeant, sr., who was the first settler on the B. P. Colby lot, bought the place. He sold to Henry M. Eaton. When Mr. Eaton retired the place was owned by various persons. Moses D. Richardson owned it several years and on his death it fell to his heirs. Mrs. Thomas Bean and her son, Gilman Bean, has resided there few years. Enoch Rowell, Junior, was my fourth great grandfather. He was born the third of July 1756 in Candia, New Hampshire. He married Rachael Worthen on 8 September 1778 and died in Plainfield, Sullivan, New Hampshire on 2 August 1840. Enoch was a veteran of the Revolution, his time in service is well documented. (See Enoch Rowell war service). Rachael Worthen came from a long and distinguished New England family; she outlived her husband and died in Plainfield New Hampshire on 1 December 1844. In his later years, Enoch waged a lengthy battle with the War department to reinstate his veterans pay; some of these documents are copied and included. Enoch died prior to the final decision. Both Enoch and Rachael are buried in the Plainfield East Cemetery. William Rowell was my third great grandfather. He was born 23 January 1789 in Candia, Rockingham, New Hampshire and died 1 August 1871 in Albany, Vermont. He married Sarah Leavitt on 22 March 1818 in Albany. She was born 10 August 1795 in Hatley, Stanstead Quebec, Canada and died 4 September 1873 in Albany, Vermont. Enoch Rowell, a native of New Hampshire, married Betsey Hodges, of Lebanon, N. H., and resided a time in Plainfield, and from there removed to Irasburgh, in 1806, and thence to this town in 1812, and located upon the farm now occupied by his son, Zuar Rowell, and his daughter, Mrs. Cass, and her husband. In company with his brother William he purchased the farm, and upon it was built the first and only distillery ever operated in the town. They contracted to pay a stipulated number of gallons of potato whiskey for the land, and when the contract was filhd the still was stopped. After paying for the farm the brothers divided it between them, William taking the northern half and Enoch the southern, which contained the buildings where he resided the remainder of his life, dying in 1839, aged sixty years. His wife survived him until 1865, aged eighty-six years. William died in 1870, aged eighty-three years. Both of these brothers took a decided interest in public affairs, and both held town offices, William was a representative in the legislature twenty-two years. He was also a strong Methodist and his house was always made the home of itinerant ministers.Eliphalet Rowell, brother of Enoch, William, Daniel and Converse, was born February 8, 1796, and came to Albany, from Plainfield, N. H., in 1818. He run the distillery for his brothers, Enoch and William, about a year, then purchased the farm where his son, Levi, now resides, near South Albany. He married Sally True, of Plainfield, and reared eight children, five of whom are yet living, and died in 1875, aged seventy-nine years.Converse Rowell, the youngest of the Rowell brothers, came to Albany, from Plainfield, N. H., about 1820. He married Orpha Chamberlin, daughter of Aaron Chamberlin, and in his early life here taught school winters. He lived for a time with his brother, Daniel, but afterwards purchased a farm on the Creek road, where Mr. Ruen now resides. His son, Willard, chose the legal profession, and is now in Arizona. Converse died in the autumn of 1882, aged eighty-four years. Mrs. Rowell died a few years previous.Daniel Rowell immigrated to Irasburgh, from Plainfield, N. H., when twenty-three years of age, and two years later married Miss Mary Johnson, of that town. In 1820, he came to Albany and located on Chamberlin hill, where he resided until his death, aged sixty-two years. Uncle Daniel, as he was familiarly called, was noted for his excellent judgment and unquestioned integrity. He was extensively employed by the merchants of Craftsbury in buying cattle and other stock. He reared a family of eight children, five of whom are now living, Mrs. Plumley, Enoch, Mrs. Miles, and Mrs. Frazer, in this town, and Mrs. Carter, in Craftsbury. Samuel Duncan Rowell was my third great grandfather and brother of William, He was born 10 July 1793 in Plainfield, Sullivan New Hampshire and died 7 July 1850. He married Mary (Polly) Moore on 2 January 1825 in Grantham, Sullivan, New Hampshire. She was born 3 July 1801, daughter of Capt. Reuben Moore (died September 28, 1850), age 75 years and Anna Foss (died May 14, 1862). Mary Moore died in Plainfield New Hampshire on 9 August 1845. Enoch Converse Rowell was my second great grandfather, son of Samuel Duncan. He was born in Plainfield, New Hampshire on October 18, 1835. His father Samuel Duncan Rowell died when he was 15 years old, his mother was already dead at the time. In 1851 he moved to Albany, Orleans, Vermont to live with his Uncle William Rowell. Enoch married his first cousin, Viola, daughter of William in 1865. He was a local politician and served in the State Legislature. He died in 1900. He and his wife had three children: William Wallace, Jennie Clover and Mary Viola. ROWELL ENOCH C, (East Albany) r 45, selectman, sugar orchard 1,200 trees, dairy 15 cows, and farmer 300. ROWELL TYLER M., (South Albany) r 45 cor 42, prop. of South AlbanyHouse, and painter. Viola Rowell was my second great grandmother, daughter of William, wife and first cousin of Enoch C. Rowell. She was born in Albany, Vermont on 23 September 1837 and died in Hardwick, Vermont on 16 June 1914. Her son William was living in Hardwick and she probably lived with him. She married her first cousin Enoch C. Rowell. They had three children: William Wallace, Jennie Clover and Mary Viola. 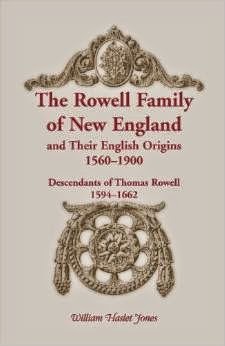 Are you a descendant of Thomas Rowell of Mancetter, England? You might be interested in this book on the Rowell Family. The book follows the family through multiple generations.